•	1kg of lamb meat (chopped into cubes). •	1cup of olive oil. •	2 medium sized onions (chopped into cubes). •	3 teaspoons of pounded garlic. •	1 teaspoon of cinnamon powder. •	1 teaspoon of 7 spices. 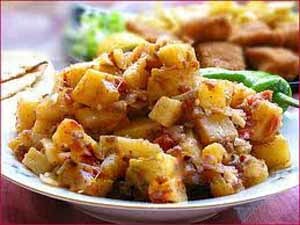 •	1/2 a kg of potato (chopped into medium cubes). •	3 tablespoons of tomato paste (sauce). •	1 liter of water. •	1 tablespoon of lemon juice. •	1 bunch of fresh green coriander for decoration. •	Add salt and pepper to meat cubes that are roasted in half a cup of hot vegetable oil, and then add onion, garlic, cinnamon and all the spices with well stirring. •	Fry potatoes in the remaining oil, then filter and set them aside, then add tomato molasses and lemon juice to the meat, then boil all these ingredients together. •	Add potato and then reduce the heat to a medium heat or backburner. •	Leave the ingredients on a backburner for 20-25 minutes until the meat and potato become lean. •	Add salt and pepper, then decorate the plate with coriander before serving it beside spiced rice with vermicelli.